There are many things worse than autoplaying video and audio on the web. The world is a messy place, after all. But it sure is distracting when you surf to a website and suddenly some video starts playing at full volume. Google’s Chrome browser and Microsoft Edge both offer tools to disable these annoyances and, starting with the launch of its next version in March, Mozilla’s Firefox browser will, too. By default, Firefox will mute any audible audio and video when you arrive at a new site unless you actively initiate the audio through clicking the “play” button, for example. Mozilla has decided to allow muted autoplay, though, which is still annoying and eats up bandwidth, but it’s significantly less disruptive to your workflow than audible autoplays. As Mozilla engineer Chris Pearce writes today, this new feature will go live with the launch of Firefox 66. He also stresses that users can always choose to opt out of this for specific sites. 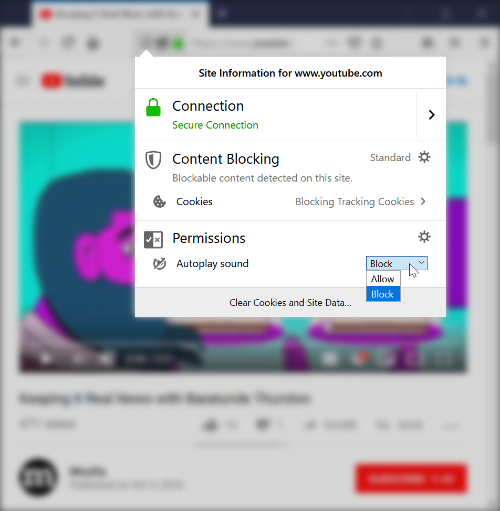 To do so, you only have to click on the new icon that will pop up in the Firefox URL bar whenever the browser blocks an autoplaying video or audio clip. One exception here is sites where users allow the browser to access their camera and microphone. Those are typically sites for audio and video conferences using web technologies like WebRTC, so this exception makes sense. If you are a Firefox user, this is surely a reason to rejoice. If you are a developer who uses autoplay videos on your sites, now is the time to repent and change your ways.